Extend with 2 USB3.0 19pin connector (can expand 4 USB 3.0 ports) from desktop PC which with one free PCIe slot. SuperSpeed USB 3.0 is backwards compatible with USB 1.0/1.1/2.0 devices (data transfer rate at 1.5/12/480Mbps). SuperSpeed USB 3.0 is fully compatible with original USB system, peripherals and cables. Fully compliant with onelane (x1) PCI Express 2.0 specification. Two internal 5Gbps SuperSpeed USB 3.0 19pin headers. SuperSpeed USB 3.0 offers 10 times performance increase over HiSpeed USB 2.0. Up to 5Gbps maximum transfer rate. 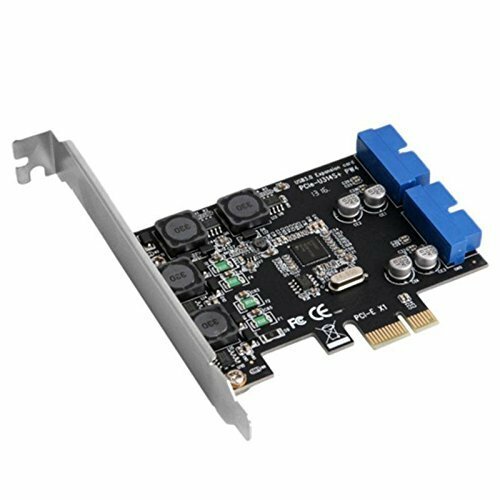 Supports PCI express Low profile. Fully Plug&Play and Hot Swap compatible. 1 X PCI-e X1 to 2 ports 19pin Header Card. 1 X Low Profile Bracket. If you have any questions about this product by Phoneix, contact us by completing and submitting the form below. If you are looking for a specif part number, please include it with your message.